Alertly can arm consumers' homes, cars, and offices. For people who want peace of mind for their car, home, or office while they’re away, Canadian security startup Alertly is building a solution for that – and to finance it, it’s launching a crowdfunding campaign on Indiegogo. Launching its campaign on Thursday with a goal of $100,000, Alertly has created a do-it-yourself security system aimed at small businesses and consumers. It combines motion sensors, high-definition cameras, and contact sensors, feeding data through a centralized hub to let users know whether anyone has entered their homes or offices. If an intruder does enter a user’s home, office, or car, Alertly will send the user a notification. Users can then choose to ignore it, view a video of the area, sound an alarm, or call 911. 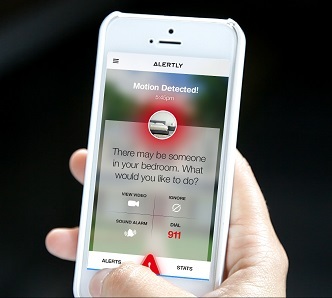 Alertly sends notifications to users if it senses intruders in secured areas. And to save users the trouble of using passwords and keypads, the system becomes armed or disarmed automatically with a key fob. By carrying this key fob, users will switch a system on or off as they enter or exit a secured place. It also has a vehicle solution, an all-in-one device that uses a SIM card to connect to cloud services. That means it can almost always be accessed via a Wi-Fi connection, and can also provide personal hotspots for its users. When Alertly launches, it will provide apps for iOS, Android, and Windows Phone, as well as web access for users who want to get notifications from their security systems. It also plans to release a software development kit, allowing developers to build their own apps on top of the existing hardware platform. Right now, pricing for a vehicle and home bundle is at $249, as part of a discounted cost for backers on Indiegogo. A home bundle is priced at $199. There are no fees for monitoring, as users do the monitoring themselves. Alertly, which just completed a Demo Day at Toronto startup accelerator Incubes, is also seeking seed funding. It’s looking to start developing and manufacturing its product by the end of 2013, with the goal of getting the product to market in July 2014.